"Bone-white sands and whispering blue seas you can get in the Maldives. 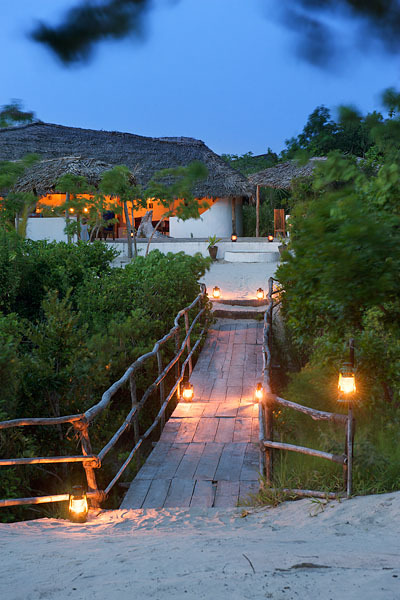 If you want atmosphere and adventure, too, says Amanda Hyde, make for vibrant Mozambique." This month Guludo has had a fantastic write up in the prestigious Sunday Times Travel magazine. Guludo was the highlight of Amanda's trip to Mozambique resulting in this great article and our inclusion in their "100 Best Hotels of the World." Stunning photos were also taken by Eric Nathan. Here's Charlie showing the Kitchen and Restaurant team photos of their food in the magazine; the size of the smiles show just how proud they are! "It's beautiful. You could stay here and do no more than watch vervet monkeys showing off from the comfort of your sun lounger. Or you could learn to dive, submerging yourself in a faraway world where nothing exists except you, the diving instructor and coral as far as the eye can see. "But Guludo has a secret: unlike those dollar-swallowing Indian Ocean mega-resorts, it was set up with a foundation attached, funding projects in 12 nearby villages, including a feeding plan that guarantees kids a free meal if they turn up at school.